Most people, books and programs will tell you that you should strive to save a specific percentage of your income each year. There is nothing wrong with this method and, if you have committed to consistently save 10% or more of your income, that’s great. 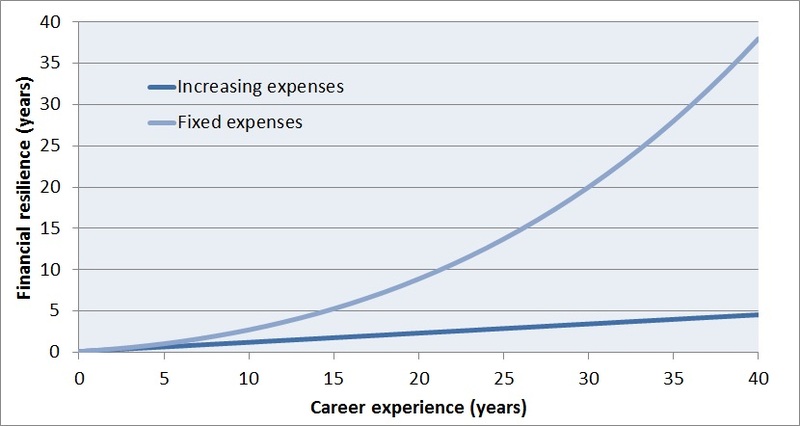 There is another strategy for saving, however, which will build your financial resilience much faster: simply striving to keep your expenses constant (increasing only with inflation) as your income gradually increases with career experience. Now the first thing I have to establish is that I am definitely not prescribing self-deprivation here. What I am effectively advocating is that you should strive to reach the point at which you have enough to live a comfortable life and then proceed to break the perceived link between money and happiness. The choice between these two saving strategies is therefore a philosophical one. If you allow for an increase in living expenses with income while saving a fixed percentage monthly, you do this because of the perception that increased consumption will bring happiness. If you manage to fix your lifestyle at a comfortable level, on the other hand, you automatically eliminate a rather debilitating dependence on consumption to stimulate short-lived pleasurable feelings and free up your full capacity to pursue those things that bring true sustainable happiness (health, personal relationships and free creative expression). In addition to potentially being psychologically much more rewarding, the fixed expenses saving strategy will also build your financial resilience at a much greater rate. Recall that financial resilience is the number of years that your accumulated financial wealth can sustain your current lifestyle. If your lifestyle keeps getting more and more expensive, therefore, increases in your financial resilience will be limited. Let’s look at an example: Two well-educated people start off their careers with a good salary granting them a disposable income of $30000 per year. One decides on the fixed percentage saving strategy (saving 10% per year) and the other decides on the fixed expenses saving strategy (keeping living expenses fixed at $27000 per year). We will assume that both their incomes increase with 2% per year in real terms (adjusted for inflation). We will also assume that their investment strategies yield another 2% per year in real terms. This definitely is a highly idealistic scenario because, as described in an earlier post, there are some major life events like buying a home and starting a family that will always have large impacts on financial resilience. However, the purpose of this simple example is only to illustrate the value of a solid commitment not to increase unnecessary consumption with rising income. The two graphs below give a clear illustration. 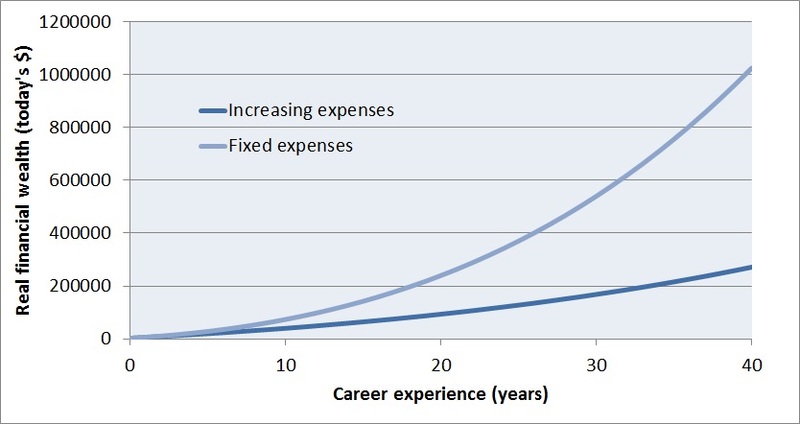 These graphs show that, at the end of their careers, the financial wealth of the person on the fixed expenses strategy is almost 4 times greater than that of the person on the fixed percentage strategy. The most important thing, however, is that her financial resilience is more than 8 times greater at the end of her career, implying that she will retire very comfortably. Was the person who increased her expenses over time happier over her 40 year career? Well, that is of course a very subjective question, and your own subjective answer to this question will determine the strategy that is best for you. 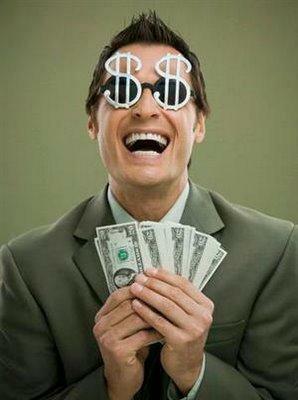 My strategy to increase my financial resillience is simple – get a job. Incidentally, I got the link to this e-book from someone else just yesterday. Perhaps you might find it interesting. At the back of the book they give many places where you can find green jobs and also link many organizations which do good on this planet. Perhaps some of those places would be interested to employ someone with your background and ambition. Thanks for the link to the e-book, Schalk. However, with regard to what I wrote, do you consider savings and pensions as separate things? What can any of us do about the fact that, by having a pension, we are buying into a globalised Capitlalist system that is surely doomed? How can we have savings that are safe if we are expecting that system to fail? Yes, they are definitely two very different things. The worst thing that people can do is to rely only on pensions with no private savings. Unfortunately, opting out of pensions is generally not possible (although Google seems to think that it might be possible in the UK). This opt-out option would be a bit weird though since the payments of people who are working are used to pay the pensions of those who are already retired (typical Ponzi scheme). I really cannot see a reason why governments would want to make an opt-out option available. Actually, I find pensions very hard to understand. National health insurance is understandable to a certain degree since something bad can happen at any time. 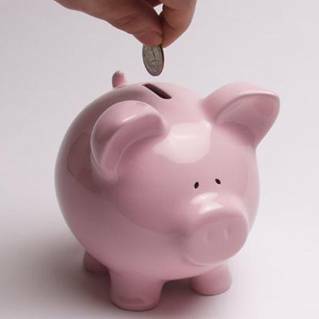 Personal savings, on the other hand, are totally within your control and extremely predictable. No safety net should be necessary for people with even the faintest little shred of personal responsibility. I’ll have quite a few posts on investment later on to give some guidelines about what to do with savings under various circumstances. If you are looking for security, I think that the two best things to invest in are 1) yourself and 2) precious metals. I’ll elaborate a lot more on that in one or two weeks’ time. One problem: If you acquire a family, fixed expenses is not possible. Children become more and more expensive as they grow up! Ah, thanks for pointing that out, I’ll make some changes to link back to the post about my own financial resilience just to illustrate that this is an idealistic case and there are some major life events that have a very large impact on financial resilience.